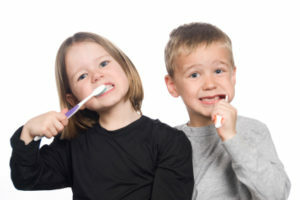 Childhood is the best time to start good oral hygiene habits and help children develop beautiful smiles. Our pediatric dentists take extra care to make children feel comfortable during appointments and excited about a beautiful smile. With 19 locations across the Las Vegas area, we make it easy to find a caring professional your child will love. From dental care including cleaning and x-rays to orthodontic care including braces or extractions, we provide everything your child needs to develop clean, straight, healthy teeth. Our pedodontists specialize in dentistry for children, providing the instruction, gentle care, and unique services children need as their teeth develop. Learn more about our pediatric dentists in Las Vegas, or visit Affordable Dental for Kids in North Las Vegas for specialized dentistry for children. What does Dentistry for Children look like? Children and adults require different dental treatments. Since dentistry is new to kids and can be scary, pediatric dentists also provide more support and comfort for younger patients. When children feel good about going to the dentist, they are much more likely to develop clean, healthy teeth and gums as adults. Children start to loose their temporary baby teeth at about 6 or 7 years old and their adult teeth come in. 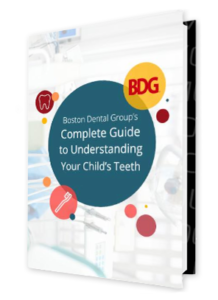 This developmental stage is ideal for straightening and moving teeth into the right position. Many children get braces, expanders, or other orthodontic treatments early on to make sure their permanent teeth come in properly. Our pediatric dentists and orthodontists have years of experience with these procedures, and we can help you find the easiest and most affordable options for your children. No one can clean your teeth like your dentist. Pediatric dentists take extra care to gently remove plaque and strengthen teeth with fluoride. Cleaning is recommended every six months. X-rays are completely safe and painless. X-rays show how teeth are coming in and developing, so there are no surprises or problems. Your dentist will schedule x-rays as needed, usually every year or two. Sealants create a protective layer over teeth to prevent cavities. Children with certain diets, dental hygiene habits, or genetic traits may benefit from sealant. Once if needed, with regular repairs at each appointment. If baby teeth decay, stainless steel crowns will help to keep the tooth strong and prevent pain or discomfort until the child loses the tooth. Apply to decayed baby teeth as needed. Sometimes teeth aren’t spaced out properly and they become too crowded. In this case, extraction is needed. Your dentist will tell you if your child requires a tooth extraction. Childhood is the best time for braces. Our orthodontists will put in, maintain, and take out all types of braces with the utmost care. Braces are only needed once, and are usually tightened every 6-8 weeks for about 18 months. All of our dentists and orthodontists are trained to perform dentistry for children with patience and care. With over 20 locations, you can easily find an experienced and compassionate professional near you. 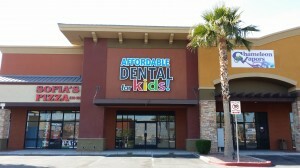 If your children are particularly nervous about the dentist, or they have had bad previous experiences, our Affordable Dental For Kids location in North Las Vegas is the perfect solution. With colorful, themed rooms, kid-sized waiting room tables, and treasure chests filled with goodies, kids love going to our dental office. Your child can even watch a movie while they get their teeth cleaned! Make dental care fun for your children and schedule an appointment with a pediatric dentist today.